Concrete Sidewalk Services in Washington County, WI. We install and replace concrete sidewalks for private homeowners and commercial businesses. We can correct any oversights that were missed by previous contractors or install new sidewalks for more recent developments. We can also install concrete steps where some may have difficulty walking up steep slopes. 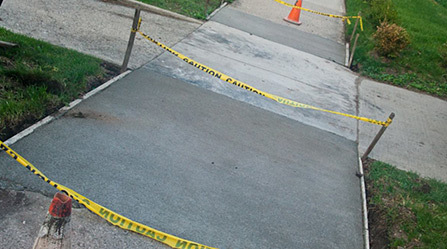 There are many benefits to installing or replacing broken concrete sidewalks. You can significantly improve the value of your home or business and make it much easier for others to navigate your property. Although it is possible to take a DIY approach, we highly recommend working with a professional concrete contractor to ensure that your sidewalk gets done correctly. Contact Pewaukee Concrete Contractor today to learn more about the process of installing or replacing concrete sidewalk on your property. Whether you are a homeowner or commercial property owner, we have what it takes to provide you with superior concrete-related services. Contact our team today to get a free estimate for your sidewalk project and take the first step towards booking a dependable concrete contractor that you can always trust.